The sleep apnea test has been developed because many patients often don't know how to distinguish between feelings caused by a sleep tendency and those resulting from muscular fatigue, depressed mood, or a general lack of energy. In what situations the sleep test is recommended? trouble getting restful sleep for more than a month. feeling drowsy despite getting more sleep than the amount that used to make you feel rested. you snore loudly, gasp or stop breathing in your sleep. Your partner should come with you to your sleep study, because he or she can give more information about your sleeping habits. You have to avoid caffeine and alcohol during the day before the test. These substances can interfere with your normal sleep. 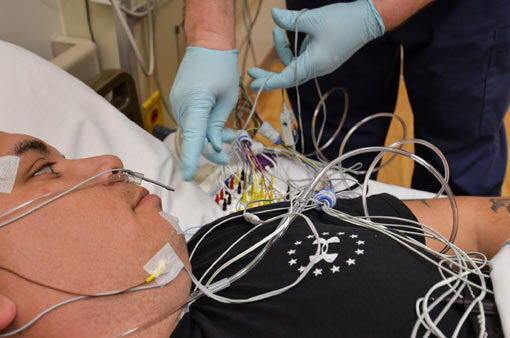 What happens during a sleep apnea test? Your test for sleep apnea will be taken in a private sleep room, which looks very much like a bedroom. You will have a comfortable bed, drapes and carpets, but keep in mind that other sleep rooms look more like hospital rooms. The procedure that is used to take a sleep recording is called polysomnography. The electronic device who record your sleep is called a polysomnograph. You will stay all night in the sleep center with electrodes and wires placed on your face, chest, limbs, and fingers. All the wires lead from the electrodes to an computer which records the information from your brain activity, heart rate and rhythm, eye movements, blood pressure and how much air moves in and out of your lungs. How Painful is a Sleep Test? A polysomnography is painless. There are no needles, no penetration of the skin and no electrical shock. So don't waste time and visit a sleep center to take the test. Another sleep test is multiple sleep latency test (MSLT). This test measures how sleepy you are during the day. If you don't have a sleep disorder, it will be difficult to fall asleep during the day, or it will take a long time. However, If you have a severe sleep apnea, you will fall asleep in less than 5 minutes. This is a sign of excessive daytime sleepiness, a symptom of sleep apnea. The sleep technician will note how quickly you fall asleep in a day time. Do you want to take a sleep apnea test online, in front of your computer? You can test yourself to find if you have sleep apnea with this questionnaire.